Gateway to one of Southeast Asia's fastest growing Business and Cultural Hub. 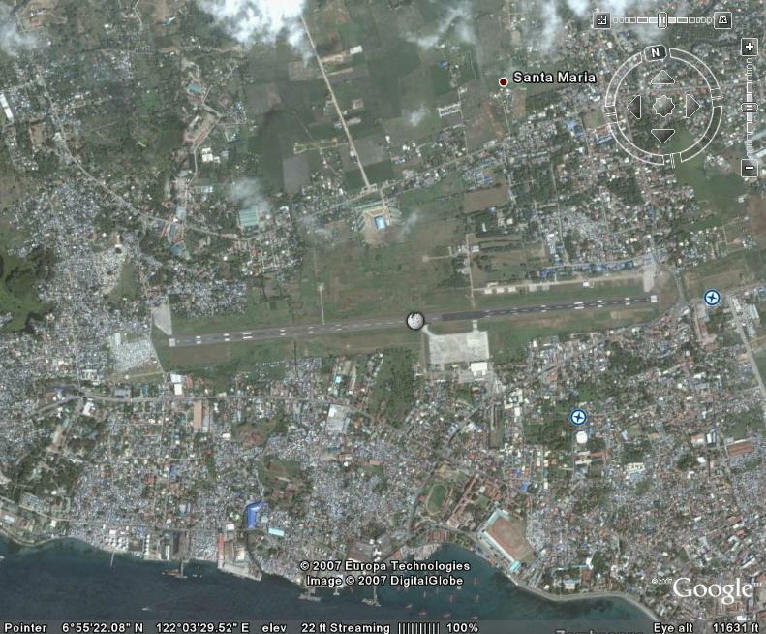 An overall perspective of the Zamboanga International Airport. Here can be seen the Airport Terminal Building, and the parking area. Our airport is classified as "International". n This is the facade of, and entrance to, the airport Terminal Building. It houses the secured Pre-Departure Area and the Arrival Area, equipped with carousel baggage loader, and the Check-in Counters. Click on the picture above to be able to view the airport from about 2 miles above. A view from the runway of the airport Terminal Building and apron.More data: Runway NR - 09/27, Runway Length - 2,610m.x46m. (cement concrete), Runway Strength - 125,000/4 kg/auw, Apron area - 30,000 sq.m. (cement concrete), Taxiway - 22m. (cement concrete), Facilities - VOR/DME/NDB/ FS/TWR/APP, and Operations - 24 hours. This is what the Zamboanga International Airport is like today. Two of the nation's major airlines, Philippine Airlines and Air Philippines, have regular schedule flights to and from Manila, aside from scheduled regular flights to and from Cebu, Davao, and other points in Mindanao. In addition, Mindanao Express, the latest airline on the scene, now operates several regional flights from Zamboanga City. It has come a long way since its origin as Moret Field in 1945. Also, as one of the results of several exchanges of exploratory talks and trade missions by participating countries of Brunei, Indonesia, Malaysia, and Philippines' East Asia Growth Area ( BIMP-EAGA ), an agreement was signed last March 10, 1997 between Sabah Air Building and Corporate Air, Inc., forming the Mindanao Express. This agreement will facilitate the provision of support of air transportation services between the State of Sabah in Malaysia and southern Philippines. 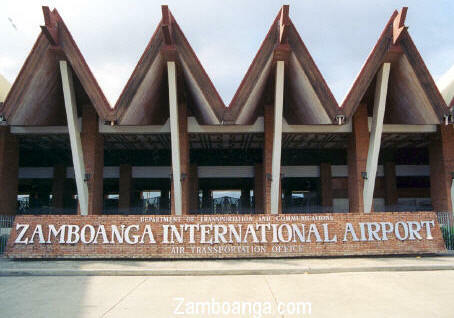 Regular flights on the Zamboanga--Sandakan route are scheduled to take off on September 10, 1997. TOURISTS and businessmen from Zamboanga City who regularly travel to Sandakan in the state of Sabah, Malaysia may soon cut travel cost and time as regular flights along this route are set to resume next month. news all about zamboanga city Davao-based Asian Spirit head John Baricuatro said they will start flying the Zamboanga-Sandakan route on May 7 on a twice a week service for the first two weeks and will consequently increase to thrice a week flight in the third week of May. Baricuatro said they decided to serve the Zamboanga-Sandakan route and vice-versa to enhance traffic movement within Brunei Darussalam-Indonesia-Malaysia- Philippines-East Asean Growth Area (BIMP-EAGA). As a domestic passenger airline, Asian Spirit will also fly the Zamboanga-Jolo starting May 1 and the Zamboanga-Tawi-Tawi on May 2, according to Baricuatro. He said they have scheduled Monday-Wednesday-Friday flights from this city to Jolo and Tuesday-Thursday-Saturday flights from here to Tawi-tawi. The Zamboanga-Sandakan flights will also follow the Monday-Wednesday-Friday schedule. Baricuatro said the air links had to be increased in support to the growing demand for air traffic in these areas, particularly Zamboanga and Sandakan. "We are reestablishing our links between Zamboanga and Sandakan because we see the growing business opportunities within these areas," said Baricuatro. "The more than one million overseas Filipino workers (OFWs) population in Sabah, Malaysia offers a bright prospect for air travel between Zamboanga to Sandakan," he added.